because it's the friday before new year's and i'm sure i'm not the only one who wishes they weren't working. herewith, a series of classic movies re-enacted by a cast of animated bunnies, in thirty seconds or less. the texas chainsaw massacre and titanic ones are especially good. isn't it nice when you realize someone else has done your work for you? i sat down to compile a list of new year's eve parties, and realized that there was no need because it had already been done. check it. as for me, i'll be drinking and dining with a group of ten or so friends and then heading to the woolworth building party for carousing and free champagne. June D, Dj Baron & TKOmri Present SoulPusherNYC The Holiday Soul Party! FULL HOUR OF JAMES BROWN WITH LIVE PERCUSSIONISTS @ MIDNIGHT!!! Free Giveaways from Filter Magazine, The Onion, Export A and Crunch all night long! Spinning an explosive mash-up of authentic funk/soul/indie and garage rock! 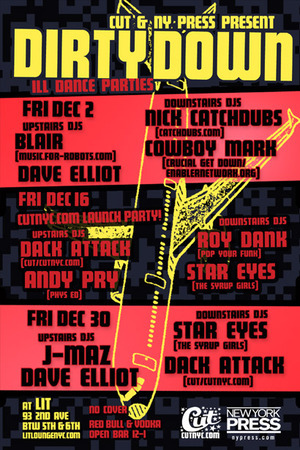 "Last Death Disco of 2005! free because you're worth it...."
*JACK AND BACK** drink specials! where is the best/cheapest/awesomest place to do karaoke right now? i'm looking for places downtown that allow big groups. on a related note, things i learned over the holidays this year. 1. people who work at my magazine read my blog. mon dieu! 2. if i lived in suburban new jersey, i could have a living room that measured 25' by 25'. 3. everyone in my family is in way better shape than i am. 4. the amount of butter that goes into one batch of christmas cookies is enough to grease the hinges of an entire small town. seriously. 5. andrew vladeck, who has several solo CDs out and plays in the honey brothers, is my next-door neighbor! a quasi-celebrity realization that almost makes up for the fact that my living room measures 2' by 4'. 6. i may or may not be allergic to dogs and pollen. thankfully, cigarettes continue to be an acceptable pollutant. -lots of time with my sisters and parents and my genius-slash-gorgeous-slash-perfect baby nephew matthew. i let him put green frosting on my nose. repeatedly. that's how much i love him. this year's haul was ridiculously awesome and i am incredibly grateful for all of it. i feel this way especially after reading that my friend drunk john received a boston terrier calendar and a gay cutting board as his xmas package. sorry man. if it makes you feel any better, my super-late "june mix" (i'm the worst cd club member ever) will be ready and waiting when you arrive in nyc for the big visit. is it friday yet? yawn. a friend who's not that into new music asked me if i'd actually heard of any of these bands. since the mainstream media usually writes stories like this that seem promising but actually talk about bands everybody liked three years ago, the fact that i hadn't heard of all of them was actually kind of refreshing. in other news, the misshapes crew fails to play well with others. and i love that the story calls them a "band". my bed sores are starting to fester, or, my rollerblades are starting to look more and more appealing. ...meaning that i really, really need to leave the house sometime soon. working from home really isn't all it's cracked up to be. perhaps you are in the same boat. cheers! Rap, grime, crunk, dancehall, breakcore, reggaeton, jungle"
THE DEATH DISCO X-MAS BASH !! Tis the season to be merry, and what better way than dancing the night away at DEATH DISCO's XMAS BASH. Yes you can wassail like a wombat to this week's mighty line-up, including as it does not only those irrepressible girls FUR CUPS FOR TEETH, but also DJ Jess's hot new band WE ARE AMERICANA, and the dub grooves of THE COOL AND DEADLY! And what's more we have added, the joker in the pack - just to make sure things go off with a bang! - your very own DJ $MALLCHANGE on the decks. It'll be hard to stop jumping around long enough to head over to the bar for our famous jack and back $5 specials, but we're sure you will find a way..
FREE ADMISSION - WE DON'T WANT YOUR MONEY! ADMISSION FREE... because you're worth it"
The blowout for those who think the Matzo Ball blows. With DJs BLAST CRISIS!, Ohmi, and CHROMEO's Dave 1, foxy dancers, goodie bags and a live performance by Aramaic rapper, Y-Love (modular moods). In addition, an open bar for the first hour sponsored by Red Stripe, Dewars AND Bacardi Flavors. Love Intelligence Group will be bringing the visual treats. We strongly advise that you arrive before midnight to guarantee admission. Tickets are $20 ($18 if you bring exact change). at Happy Valley, 14 E 27 Street, New York, NY, 10016"
i do love you, and i do support the unions, but it's no fun living here during a transit strike. at least i'm not one of the poor souls who has to a) picket or b) walk to work in the 38 DEGREE WEATHER. insanity. i thought about strapping on the old rollerblades, which i'm unembarrassed to say i did during the blackout last summer, but the prospect seemed completely unappealing, given the high likelihood of my snot freezing to my face and causing lasting damage. on a lighter note, parisians are so cute. new york 1 interviewed a cute french girl about the transit strike who giggled and said, "oh i don't know, in paris this happens a lot, it is like no surprise, so is not bad for me!" aw. on a not-so-light note, pat kiernan just announced that the windchill factor is going to make today's weather feel like it's in the teens, so everyone bundle up if you're headed outside. (Berlin GERMANY), The Plimsouls (Los Angeles CA), Robert Pollard (Dayton OH), Ramblin' Jack Elliot (New York NY), Saves the Day (Princeton NJ), The Secret Machines (New York NY), Marty Stuart and his Fabulous Superlatives (Hendersonville TN), Tarantula A D (New York NY), Susan Tedeschi (Jacksonville FL), Towers of London (London UK), KT Tunstall (London UK), Two Gallants (San Francisco CA), Tom Verlaine (New York NY), Vetiver (San Francisco CA), The Whigs (Athens GA), Witch (Brattleboro VT), and Wolfmother (Sydney AUSTRALIA)."